Gardman R894 Trough Shaped Coco Liner. Preformed trough-shaped coco liner constructed of all natural coco-fiber from coconut tree. Replacement coco liner for Gardman 48" trough planters: R944, R969. The 12” depth provides exceptional soil volume and moisture retention. Coco fiber provides superior drainage and aeration promoting fuller and healthier plant development. Planting tip: adding a plastic liner will help hold moisture in so you can water less often. Use something as simple as a grocery sack. Poke holes in the plastic liner to allow planter to drain adequately. Dimensions: 48" Long x 13" Wide x 12" High. 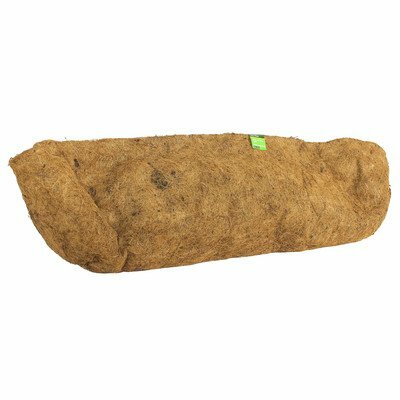 Gardman "Bring your garden to life"
Replacement Coconut Coir Coco Liner for Hanging Basket - 16"